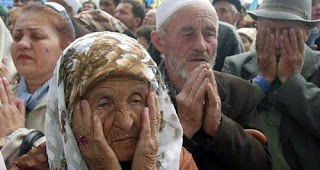 CRIMEA, Ukraine -- Each year on May 18, around 25,000–30,000 Crimean Tatars gather in Crimea’s capital Simferopol to commemorate the 1944 deportation of their parents and grandparents from their historical homeland. Crimean Tatars commemorating the 1944 deportation by Joseph Stalin. They come to Simferopol from all cities and towns and conduct a peaceful meeting organized by the Mejlis — the executive body representing the Crimean Tatars — in front of the Crimean Musical Drama Theater in Simferopol’s Central Square and remember the victims of the mass deportation on guarded and sealed cattle-trains. Of the total Crimean Tatar population at that time, 46.2 percent perished during this forced exile . Crimea differs from the rest of Ukraine because it is the only autonomous republic with its own unicameral parliament (with 100 members) and Council of Ministers, thus having a similar institutional structure to that of the Ukrainian state. Under all previous presidents of Ukraine, the planning of this May 18 Crimean Tatar Remembrance Day of Victims of the Deportation event had received considerable support from both the Crimean and the Ukrainian authorities. In fact, during these commemorative gatherings, alongside the Mejlis officials and the mufti (religious authority) of Crimea, a representative of the Ukrainian president, the head of the Crimean parliament, and the head of the Ukrainian Orthodox Church of Kiev Patriarchate (UOC-KP) participated in the ceremonies. In 2013, however, under Anatoli Mogilev, the chairman of the Council of Ministers in Crimea, the governmental attitude to the Day of Remembrance has changed drastically. Mogilev was appointed by President Viktor Yanukovych in November, 2011. Insisting that he was ill, he opted out of the May 18 gatherings in 2012, marking the first time a Crimean leader did not participate in this event. Even before his appointment, Mogilev was well-known in Crimea for his anti-Tatar sentiments, his brutal order of police units (BERKUT) to attack peacefully protesting Crimean Tatar business owners in the Ai Petri hills in 2007 while he was a police chief, and his subsequent Krymskaya Pravda article (2008) in which he praised the Joseph Stalin–era deportation of the Crimean Tatars. On February 25, 2013, under Mogilev’s leadership, the Crimean authorities announced that the May 18 event needed to be approved by the Crimean Council of Ministers. Consequently, the Simferopol City Council declared that they were going to ban the annual May 18 gathering that has been organized by the Crimean Tatar Mejlis since the early 1990s. This decision of the Crimean authorities was not received well by Mustafa Cemilev, the head of the Mejlis, who stated that Crimean Tatars will come to the Central Square in Simferopol as a large collective regardless of the ban, and if they are not allowed to hold their remembrance day, then they will block the roads, paralyze traffic, and take their protests to other regions of Crimea. Meanwhile, the Crimean authorities affirmed that they accepted a proposal from the Milli Firqa (National Front), an opposition group to the Mejlis, which was now going to be in charge of the May 18 event. There are irreconcilable differences between these two groups. The Mejlis is the single body representing Crimean Tatars in Crimea since its establishment in 1991. Milli Firqa, on the other hand, consists of a group of Crimean Tatars who had called on the Russian Federation and Tatarstan to “defend the indigenous and other numerically small ethnic communities of Crimea against the genocidal policies of Ukraine” right after the Russian-Georgian August 2008 war . On March 12, 2013, in an interview with the Russian-based news site Noviy Region, Mogilev stated that he did not recognize the Mejlis, referred to it as an entity outside the legal framework of Ukraine, and wanted to omit the word “Mejlis” from any conversation. Consequently, Cemilev suggested that Mogilev should read the past rulings of the Ukrainian state, reminding him that the Mejlis was approved by the president of Ukraine via a signed decree on May 18, 1999. In April 2013, the organizing committee under Mogilev’s chairmanship declared that this year’s May 18 gathering was going to be held in two different locations in Simferopol: one in the Central Square organized by the Mejlis, and the other, organized by the members of the Milli Firqa hand-picked by Mogilev, in front of the Supreme Council of Crimea (Verhovna Rada—the regional legislature). Rejecting the idea of this “divided” day of remembrance, the Mejlis still continued trying to construct a dialogue with the Crimean authorities and sent a letter to the chairperson of the Committee on Human Rights, National Minorities and Inter-Ethnic Relations, Andrei Shevchenko, and asked him to mediate between the Crimean authorities and the Mejlis. In an effort to avoid unnecessary conflict in Crimea, Shevchenko asked President Yanukovych to intervene in the conflict between the Crimean government and the Crimean Tatar Mejlis; but Kiev remained unresponsive. Aggravated by Kiev’s silence, while Cemilev was visiting the Czech Republic and then Germany in April 2013, he met with diaspora members living in Europe and informed them about the issues facing the May 18 event in Crimea. Subsequently 38 members of European diaspora organizations gave Mustafa Cemilev their full support and declared that they were going to hold peaceful protests in front of Ukrainian embassies in Berlin, Brussels, Paris and The Hague. Subsequently, they circulated online flyers about these protests with the addresses of those embassies in each country on social media (Facebook and Twitter); they also posted a video on the 1944 deportation on YouTube. On May 4, the Mejlis held an emergency meeting with Crimean Tatar diaspora organizations from Europe, the United States and Turkey. At the end of this meeting, 41 Crimean Tatar diaspora organizations in Turkey as well as others from Romania, Bulgaria, Poland, Lithuania and the United states jointly stated that, to show their solidarity with the Mejlis, they were going to execute the same protest action in front of Ukrainian embassies in their respective countries . Meanwhile 12 billboards dedicated to the victims of the 1944 deportation were installed in Simferopol and in other locations. On May 10, Milli Firqa declared that they were not going to hold a gathering in front of the Crimean parliament, and that they were not going to participate in the rally organized by the leaders of the Mejlis in Simferopol’s Central Square. As the anniversary of the May 18 deportations approached, it is not clear how the events were going to unfold. Nevertheless, the developments leading up to this year’s commemoration illustrate that, under President Yanukovych, Ukraine regressed in terms of inter-ethnic relations in Crimea. Conflict prevention on the peninsula is important, especially now, five months prior to the Association Agreement with the European Union, including a Deep and Comprehensive Free Trade Agreement (DCFTA) due to be signed in November 2013. These recent political intrigues in Crimea undoubtedly underscore the countless issues that still need the attention of Ukrainian and international policymakers.